A slowdown in the industry took a bite out of sales growth this past quarter. Clothing and accessory retailer Kate Spade (NYSE:KATE) saw its stock fall by double digits last month, dropping 13%, according to data provided by S&P Global Market Intelligence. The decline wasn't significant for long-term investors. 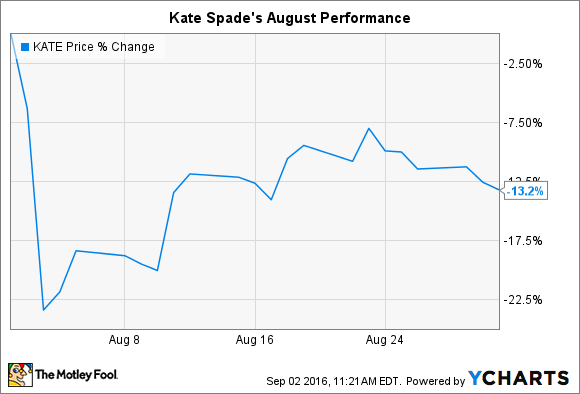 Kate Spade shares are still beating the market so far in 2016 and are up nearly 250% in five years, compared to an 86% increase for the S&P 500. August's drop was sparked by second-quarter earnings results that failed to meet management's expectations. Comparable-store sales growth plunged to 4% from the prior quarter's 19% jump. Executives said the shortfall was driven by weakness in the apparel industry and by an unusually strong U.S. dollar that kept foreign visitors out of U.S. shopping malls. "Several factors contributed to our second-quarter results falling short of our expectations," CEO Craig Leavitt told investors, "the most impactful of which are the retail landscape and continuing tourist headwinds." Other retailers such as Macy's and Tiffany reported similar struggles in selling at their flagship tourist locations. On the positive side, Kate Spade's gross profit margin performance was strong, and the company sliced administrative costs so that operating income jumped to $25 million, or $0.25 per share, from $9 million, or $0.07 per share in the year-ago period. Leavitt and his team don't believe the expense improvement will be enough to outweigh the drag from lower customer traffic, though. Management downgraded their sales growth outlook to roughly 10% from the nearly 14% it projected in May. Earnings gains will also be slightly more muted, they said. Those aren't exciting forecasts, but the struggles appear to be tied to industrywide weaknesses, and not to execution problems around merchandising or pricing. That's why investors should keep a close eye on sales growth and profit trends over the coming quarters, especially in comparison to peers -- but shouldn't rush to sell shares simply on account of last quarter's slump.